We weren’t even looking forward to racing. I was getting over a cold. The air conditioner at our house broke just about the time that the humidity went above 114%, and we haven’t been sleeping well. The remnants of Tropical Storm Bill were due to arrive shortly, pushing rain and generally turbulent weather our way. We just raced last week, and it’s extremely unusual for our club to have back-to-back race weekends. We were kind of hoping that the race would be postponed. As we were sailing around while the course was being set up, someone suggested over the VHF that we could switch the race to a long-distance format and take advantage of being able to reach in both directions—the wind had shifted around to the southeast, which was going to make for a relatively short windward-leeward course. We quickly chimed in that we were fully on-board with that idea. While perhaps less sporting, it certainly seemed like less effort…and we were all about less effort. The race went on as originally planned: a 0.9nm windward-leeward course with two laps and a committee boat and pin in the middle. Seven boats raced, which is a pretty good turnout for a Windjammers race. Lorelei didn’t have crew and volunteered to serve as race committee. I don’t think we’d ever heard the skipper of Lorelei on the VHF before, but it was kind of fascinating since he’s a commercial pilot. He had the sort of radio elocution that is usually reserved for announcements regarding the “fasten seatbelt” light. Despite all of our reservations, once we got into the sequence we were (or at least I was) in race mode: that sense of enhanced situational awareness with a pang of urgency. With one minute to go, we weren’t exactly right at the line, but we were in an ideal position to push a windward Tiki to the wrong side of the committee boat. What I didn’t account for was that the new Tiki—a Pearson 36 with my old racing mentor Val at the helm—does not wait for Catalina 27s to squeeze them off of the starting line. They trimmed in and disappeared like the Millennium Falcon jumping to light speed. The starting line was quite wide, giving the other boats a relatively spaced-out start, and we were quickly toward the back of the pack. We continued on a long starboard tack toward the left side of the course, and may have been the last boat to make the tack toward the windward mark. As we approached, we caught up with Stormy and rounded the mark together. The wily skipper of Stormy blanketed us as we turned downwind, and passed us before too long. It would take us the entire leg to pass them again. Even then, we never got much past a conversational distance with them. That small bit of advantage proved to be enough, though. We rounded the leeward mark and stole their air as we came upwind. Stormy had no choice but to tack away. The wind had continued to clock around, making the southern side of the course favored, so we stayed on port tack, making up ground on the fleet as Stormy sailed off to the north. 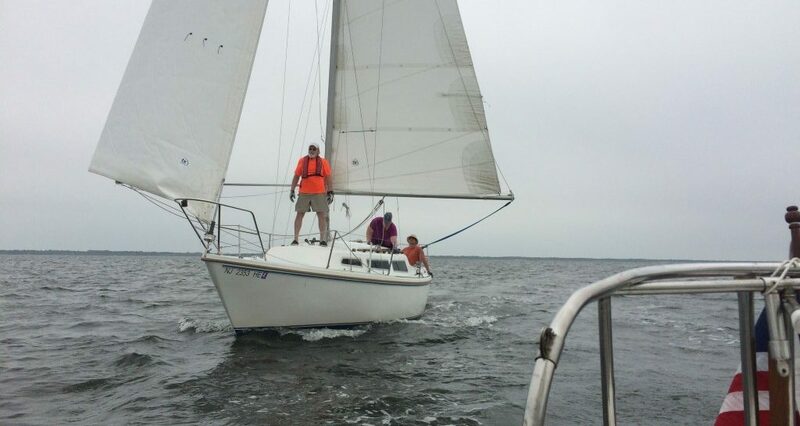 We rounded the windward mark again and Sailor Steve was quick with the pole on the foredeck. I put Jen on the boom like a human preventer, and we were trucking, just slightly by the lee. Elenora—the big Freedom 35—was ahead of us, but they were off on a broad reach, trying for better VMG. I have no doubt that there are real advantages to that, but on such a short course, we closed the gap quite a bit by the time we rounded the leeward mark by sailing dead downwind. Tiki finished first, eight minutes ahead of the next boat, which was plenty to secure first overall even after PHRF corrections. Sunset, Elenora, and Fortuitous came in next, in a tighter grouping and in that order. Stormy, Island Breeze, and Callisto were spaced out somewhere behind us. On corrected time, we came in second of seven boats, which I’m pretty proud of. It may have been one of our tightest races ever. I think most of our tactical decisions were correct, we sailed pretty much mistake-free, and we finished ahead of some very experienced skippers. The rain held off, and I was glad that we stuck it out despite our initial trepidation. You never know what’s going to happen out there. Thanks to Jen and Sailor Steve for crewing again. Nice race.